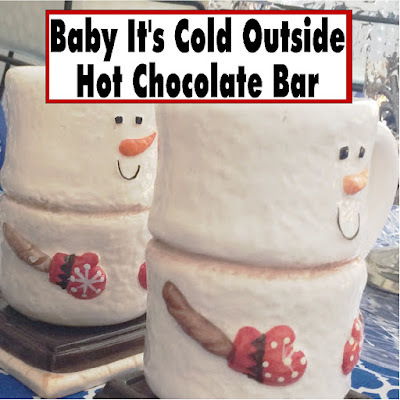 Keep warm this winter with a hot chocolate bar that will be as cute as it is helpful. 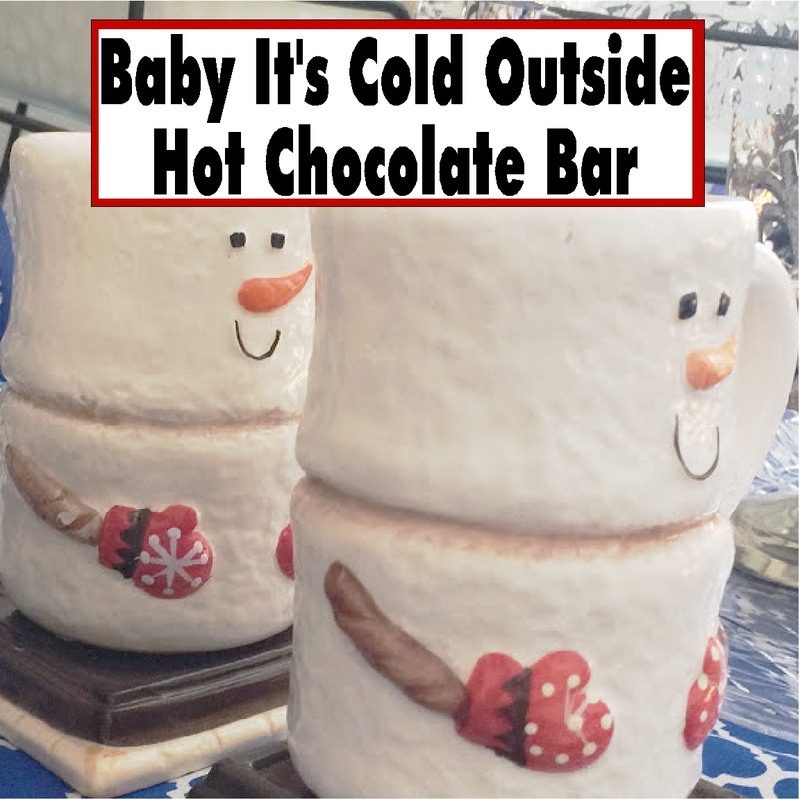 With just a few items you may already have, you can make a super cute Snowman Hot Chocolate bar that will keep you warm when it's cold outside with a warm cup of cheer. Whether you live in the arctic north or the southern states, winter can last a LONG time. The skies get grey. The weather turns chilly. And everything kind of gets glum. As much as it would be fun to have the Christmas lights on all winter to brighten the day, I have a feeling my neighbors might start to wonder. So there needs to be another way, easier, with less neighbor judgement to brighten and warm the winter days. What better way to do that then with a chocolate bar?!? For years, I lived in Northern Maine, Indiana, and Colorado. We saw our fair share of Snow. I remember being able to jump out my 2nd story window, straight into a snow pile that swallowed me whole! As a kid, it was awesome! As an adult, I HATE to be cold. With a passion. So even though I now live in South Carolina, where it's 70 degrees yesterday, I still enjoy a good mug of hot chocolate...or two.. or three. Okay, I just love hot chocolate, and love to have it anytime. It's a great way to warm up, brighten the day, and make the winter seem bearable. Before winter begins and you get snowed in, or just find the "blahs" of winter, set yourself up a quick and beautiful hot chocolate bar so you will have a cup of cheer anytime of day. One of the cheeriest and most important parts of your hot chocolate bar are the mugs. Having a set of super cute, LARGE mugs is essential. You want to make sure your hot chocolate will be enjoyed and last, so make the mug as big as you can drink. I found these S'mores Snowmen mugs at a thrift store this summer and knew they would be perfect for hot chocolate this winter. They are HUGE and super cute. In the center of the table, I used my glass serving beverage containers. One was filled with milk, while the other was filled with the hot water. If you are having a party, I recommend adding the beverages last so the milk stays cold and the water hot. I won't leave the beverages on the table all winter, but will fill them when we have company over or have been out in the cold for soccer. Under the beverage containers, I placed a plastic serving dish I found at Dollar Tree. This will help catch any spills from the hot chocolate or leaks from the beverage containers as they get used. In the center of the tray, I used a snowflake candle holder that I found at Bath and Body Works last year on clearance. If you will be hosting parties a lot, I recommend always keeping your eyes out for cute pieces that are cheap and will work in a variety of ways. Along both outer edges of the tray, I placed the snowman hot chocolate mugs, and then some cute jars with toppings for the hot chocolate. These are the same jars that I used in my Ice Cream party. So once again, use what you have so you can justify to your husband that those purchases are worth it! Behind the toppings, I placed the hot chocolate flavors on a small box that I covered with coordinating fabric to the table cloth. This gave the hot chocolate bar a little height and allowed my flavors to be easily seen and used. I was seriously tempted to try some of the hot chocolate recipes from my pinterest board. I've been collecting recipes for a while, but I knew I needed to make this super easy if I was going to be able to keep it up and use it all winter long. So instead I bought some flavors from the store and just repackaged them into cute containers. I used the jars from the Ice Cream party and I made bigger ones with a snowman design (I showed you how to make them here) for the flavors I knew would get used the most. To make sure we don't mess the flavors up, I used these Snowman table cards from our Printables shop to label the hot chocolate flavors. They match the Snowman Kisses, so that works perfectly to keep the flow of the table. 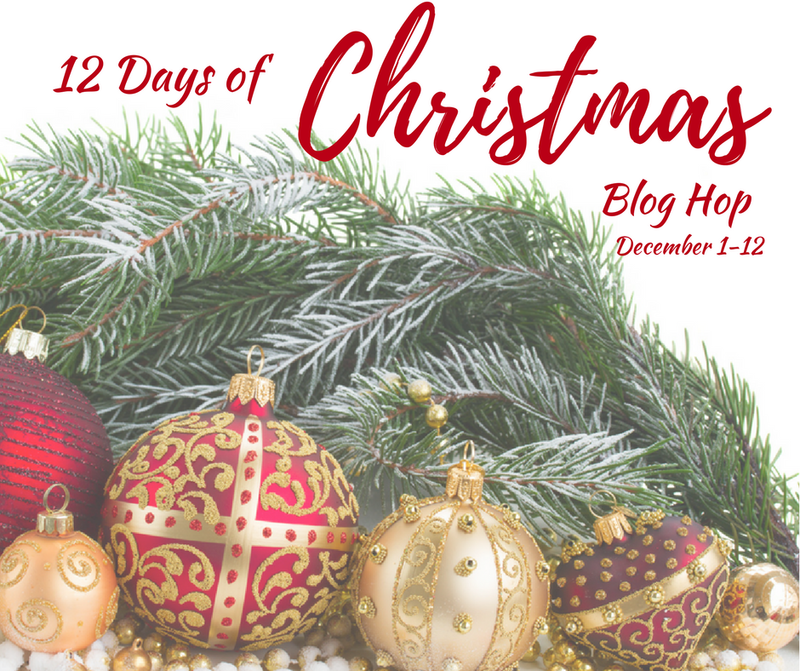 We will have Cookies 'n Crème hot chocolate, Nestle Milk Chocolate, Cold Stone Peanut Butter Cup Perfection hot chocolate, Peppermint hot chocolate, Belgian double Chocolate hot chocolate, and Salted Caramel hot chocolate.